•	How do I know I’m doing what God wants? •	Will God approve of my decision? •	Is this the best decision I can make? •	Will God still bless me, care for me, protect me and guide me if I make a decision that is not THE very best in His eyes? •	Can I be secure in my decision? •	Does my life overall reflect that I know God’s will for it? •	Is my life being affected because I’m not in God’s will? •	I want to do what God wants but how can I know for sure? 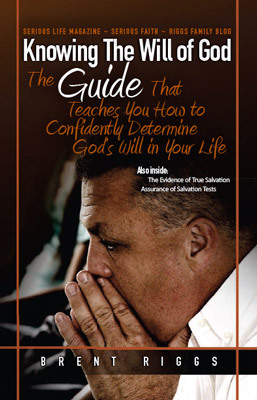 In this humble little guide, I will present to you principles, questions and of course, Scripture, that layout out a predictable groundwork that will help you know God’s will about the entire scope of life… the big questions, the little choices and the life changing opportunities that require a decision. •	How do I know I’m doing what God wants? •	Will God approve of my decision? •	Is this the best decision I can make? •	Will God still bless me, care for me, protect me and guide me if I make a decision that is not THE very best in His eyes? •	Can I be secure in my decision? •	Does my life overall reflect that I know God’s will for it? •	Is my life being affected because I’m not in God’s will? •	I want to do what God wants but how can I know for sure? There has been much written on the topic ranging from the overly simplistic to the useless wishy-washy. God did not create us only to leave us hanging without a way to know what He would have us to do. No, it’s not a legalistic “A-B-C, 1-2-3” checklist but I’m convinced it’s not nearly as ethereal as commonly thought… nor is it attainable only for the “super Christian”. In this humble little guide, I will present to you principles, questions and of course, Scripture, that layout out a predictable groundwork that will help you know God’s will about the entire scope of life… the big questions, the little choices and the life changing opportunities that require a decision. The answer to “what is God’s will” is two part, the first part being “simple”; and the second being an exercise in “working out your salvation”. To shed light, the rendered Greek for “work out” means to “continually make an effort to bring something to pass or completion”. From other Scripture, we know this can’t be speaking of earning your salvation by “works”. It refers to a Christian diligently seeking (“working out”) God’s will and then obeying it in order to become more Christ-like (sanctification). Knowing God’s will is hard work. In our day and age of “fast”, “easy” and “convenient” everything, there are few people who want to do the hard work of knowing the mind of Christ. Examples: Should I cheat on my taxes? Should I get divorced because I love someone else? We’re engaged, can we sleep together? Is it okay to get drunk occasionally? Examples: Is it a sin to drink a glass of wine? Should kids go to public school or be home schooled? Can you ever see a Rated-R movie, or any movies at all? What clothing is appropriate? Should you celebrate Halloween or Christmas? Can a Christian be in the military and kill someone in a war? We’ll start with the “simple” part before looking at how to determine God’s will for the “gray” areas. The “simple” part is the where our questions are directly and plainly answered in Scripture. It’s only “simple” however in the sense that we can know God’s will; obedience however is frequently NOT so simple. Find out what the Bible says, and do it. While in concept “finding and doing” is simple, it is NOT simple to actually achieve it. You have to diligently search the Scriptures (2Timothy 2.15; Acts 17.11) and when you find a plain answer, you must obey it, or you are in danger of deceiving yourself about your walk with God. IMPORTANT: you cannot hope to grasp the finer and less obvious points of knowing God’s will if you aren’t willing to simply obey the clearly revealed parts. I often have people ask me for advice or to pray for them to know God’s will when they are ignoring what God has already plainly said.